Kraft-Heinz went sour: a historical look at KHC's ratings and rankings. Full portfolio summary of quality rankings and ratings. After the significant decline in the last quarter of 2018, the market staged a comeback nearly its equal. At the tail end of this dramatic comeback, much of the talk suddenly shifted to the fact that the spread between 10-year and 3-month Treasuries had inverted -- is it a harbinger of recession? Many of us choose to fill our portfolios with high quality companies at least in part as a defense against the kind of market wipeout we witnessed in 2008. The shares of durable companies will likely still lose market value, but we expect that the companies themselves will prove resilient in tough times and continue to pay out their dividend through the storm. The question is thus, which companies are the high-quality, durable ones? 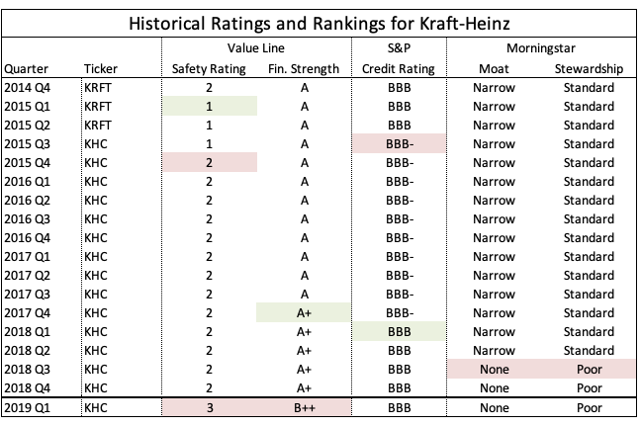 This quarter we received confirmation that Kraft-Heinz is, alas, not one of them. Their earnings report on Feb. 21 delivered a battering of bad news: a miss on earnings and revenue, a huge $15B write down of value on its brands, an SEC investigation, and for many dividend growth investors, the death blow of a 36% cut to the dividend. KHC proved not to be a high quality company, but what did the ratings and rankings say? Below is a table of the records I've kept for KHC and its predecessor, KRFT. Each rating upgrade is shaded green, while each rating downgrade is shaded pale red. A few things jump out. The company's S&P credit rating was never good, but it did receive an upgrade a year prior to the debacle. 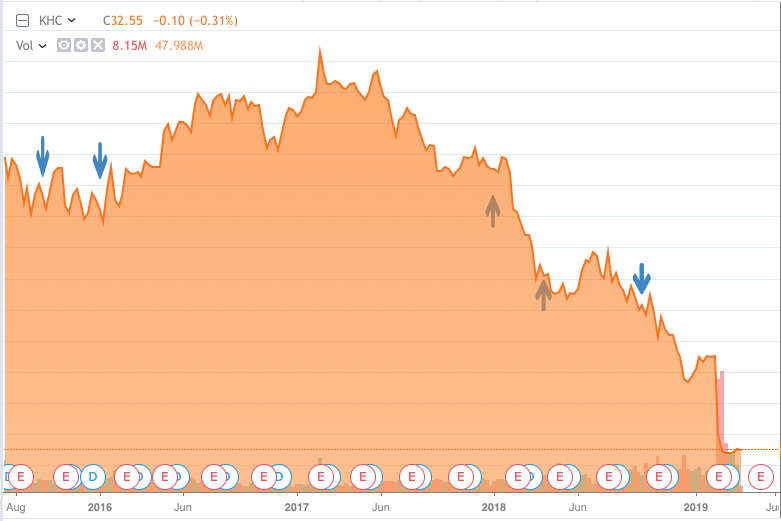 (I should note that after the credit rating downgrade in the 3rd quarter of 2015, the stock's price went from about $70 to a high of around $95 in early 2017.) Value Line considered it safer than the average company, with decent enough financial strength -- as it turns out, wrong on both counts -- and it downgraded safety and financial strength only after the damage was done. Overall, the aggregated quality ratings were far from optimal: it never had at least a BBB+ credit rating; it never was considered to have a wide moat or exemplary stewardship; and while the Value Line ratings weren't bad, KHC's were never in the top tier. 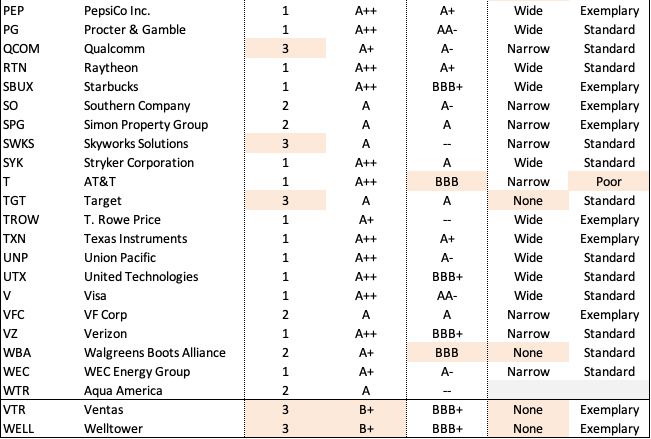 Morningstar might be considered to have signaled a warning with its downgrades of both Moat and Stewardship in the 3rd quarter of 2018. Given these lackluster ratings, in retrospect it's fair to ask: why did any seeker of quality own this? I can't speak for everyone, but from the many comments I've read and my own experience, I believe it was a combination of the defensive nature of the products they sell, Warren Buffett's imprimatur, and the dividend. Below is a chart of KHC with arrows showing roughly when the downgrades and upgrades happened (aside from the first upgrade when it was still KRFT). Ironically, an investor would have done pretty well buying on those first downgrades, and at least would have spared a lot of losses selling on the first upgrade. While the chart above seems to deliver a rebuke of quality ratings and rankings -- buy on a downgrade, sell on an upgrade? 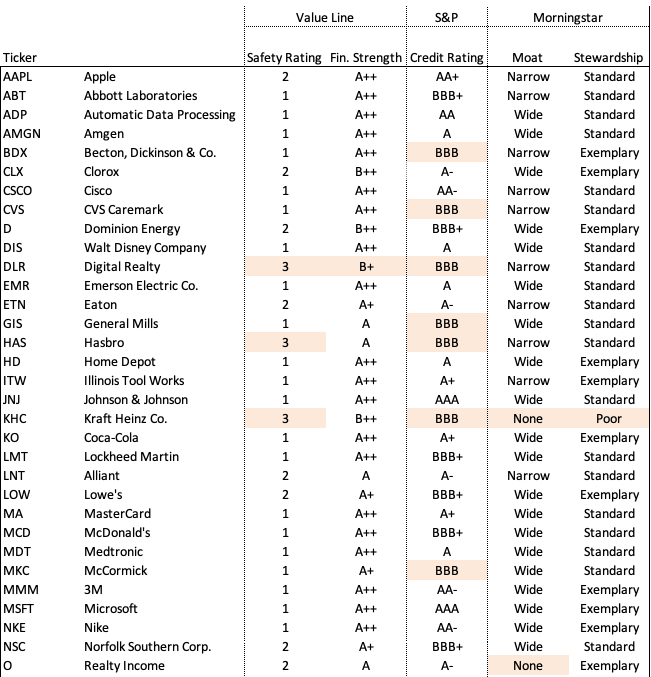 -- I nonetheless present below a table of every company with the top ratings for safety, financial strength, moat, and stewardship that also has an S&P credit rating of at least A. Use at your own risk! I don't follow all of these companies, but if someone has a caution flag to wave on any of them, it would be interesting to hear. This quarter I neither entered nor exited any positions. That includes KHC; I took the loss in the taxable account but still have shares in a retirement account. It's now a small position, but I'm leaning toward just letting those shares go too. There were 4 noteworthy upgrades this quarter, while 2 of the 3 downgrades belonged to KHC. Below is the table of ratings and rankings for the companies in my portfolio. As always, ratings that are lower than what I want to see are shaded in orange. Although I sold out of VTR and WELL awhile back, I still keep them in the table because I might buy back in. Their ratings and rankings are relatively low though, so I'm not in a hurry. As always, I hope the information here is helpful! GLTA.